Lithium-ion (Li-ion) batteries have established themselves as a leader in energy and power densities for mobile applications. These batteries account for a market worth more than $10 billion, and have a complex value chain with many stakeholders. However, the reign of Li-ion will soon be threatened by next-generation batteries. While much of the motivation for next-generation batteries – whether in the public’s imagination or governments’ largesse – comes from transportation, our analysis shows that the automotive market will be the last to adopt next-generation batteries due to the extreme cost sensitivity of automakers, stringent safety and lifetime requirements, and long, cautious adoption cycles. The makers of next-generation batteries will have to look to other markets first. While military applications are always a happy hunting ground for emerging technology, it is the designers of consumer devices, still the largest Li-ion application today, that will move the next generation battery market more meaningfully as they continue to push towards devices with smaller footprints. Operating systems like Microsoft Windows or Apple OS X are increasingly being deployed in handheld smart phones and tablets and system complexities will only grow with time and in smaller, thinner devices. Batteries are a major roadblock today on the way to this goal: The thin, small, lightweight batteries of today simply do not pack the energy required by truly novel consumer electronics. 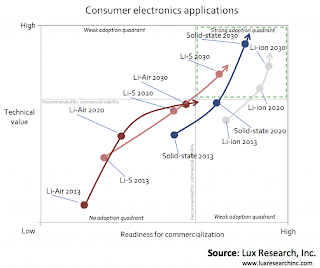 Analyzing the consumer electronics space, solid-state batteries will provide real completion to Li-ion in the consumer electronics market, offering tremendous technical value for a segment that prizes volumetric efficiency and low costs. The incumbent, Li-ion, will put up a worthy fight but by 2020, solid-state will draw close as current complex manufacturing processes that are a challenge today are solved, costs fall and energy densities rise. From this foundation, it will surge past Li-ion in technical value by 2030. lithium–sulfur batteries (Li-S) will also make strong progress, but won’t quite match the well-rounded value propositions of solid-state and advancing Li-ion, finding only niche consumer electronics applications that prize excellent specific energy above all else. Li-air is a non-factor in this sector, hampered by its volumetric inefficiency and its need for peripherals. For innovative companies with materials science, chemistry or battery systems expertise, the landscape of next-generation energy storage technologies presents a bevy of opportunities, whether consumer electronics, military or the shiny transportation prize so much R&D investment is chasing. Just like we have seen in Li-ion, some startups will falter through overexpansion, others through misjudged applications. 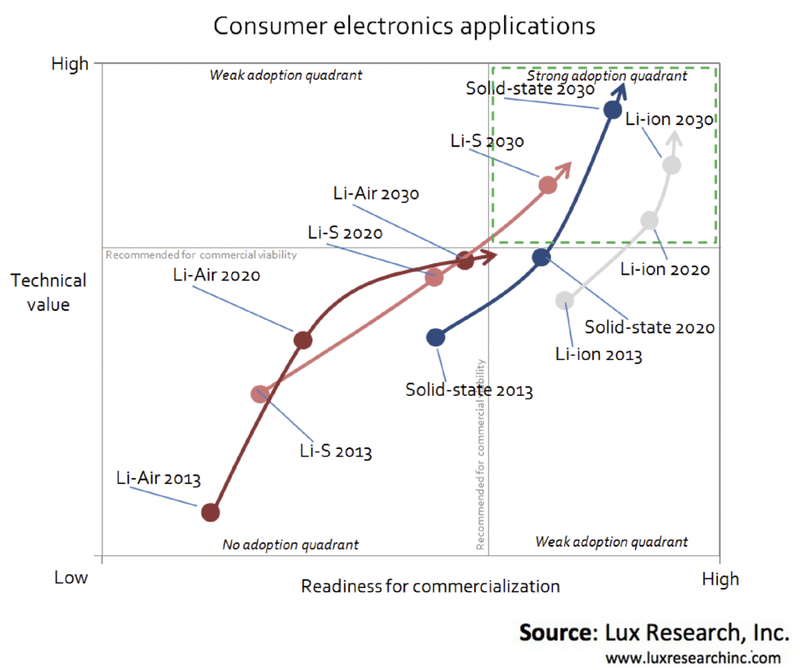 The road to technologies like Li-air, Li-S, and solid-state batteries is long, but the time to start paying attention and tracking the development of specific companies, technologies and applications is now.